India urged China not to view its development work in the border areas with distrust. India pitched for free navigation in the contentious South China Sea aimed at boosting trade and raised concerns over CPEC, sources said as the defence ministers of both nations met on Thursday. The meeting of defence minister Nirmala Sitharaman and the Chinese counterpart Gen Wei Fenghe included extensive discussions on bilateral defence related engagement as well as regional and international developments, a press statement of the Ministry of Defence said. Sitharam also extended an invitation for one of the military chiefs of China to visit India soon. 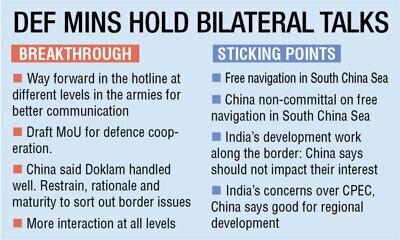 Taking forward Prime Minister Narendra Modi's vision that the two countries won't allow differences to turn into disputes, the Chinese delegation was of the view that border issues can be sorted out with restrain, rationale and maturity. "They said Doklam was handled well and all issues can be handled in the same manner," a government official said. While the Chinese referred to China Pakistan Economic Corridor (CPEC) as a project of "regional development" the response to India's development projects along the border was that it should in no way impact China's national interests or sovereignty, sources privy to the details said. 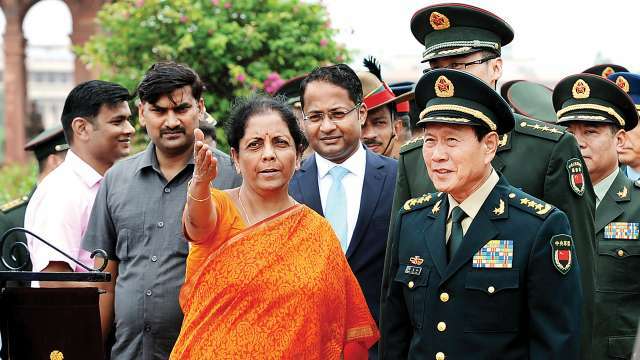 Sources said Sitharaman said border area development in terms of road connectivity, water supply and electricity should not be viewed with doubt by China. CPEC runs through Pakistan Occupied Kashmir that has been a sticking point. The corridor will link ports in Karachi and Gwadar with Xinjiang in China. Freedom of navigation in the South China Sea is of immense importance for India from a trading point of view and was taken up in the discussions but sources said there was no response on it from the Chinese side. The territorial disputes in the South China Sea among several countries in the region have made it a contentious region. "The ministers also discussed issues relating to border areas. It was agreed to work towards full implementation of ongoing confidence building measures," MoD said. The long standing demand for a hotline between the armies was also taken up. The Chinese suggested a hotline at 2-3 levels for better communication. The two sides decided to work towards an agreement and sign a Memorandum of Understanding (MoU) on defence cooperation and replace the last one from 2006. Engagement between armed forces, training and joint exercises will also get a push, it was decided. The ministers welcomed the enhanced mutual trust and welcomed recent exchanges between the militaries of both countries to implement the consensus of PM Modi and President Xi Jinping in Wuhan. "More interaction at all levels—unit, brigade and command between officials of the army is the way forward to forge better ties, both sides agreed," said an official. This is the second one since the Doklam standoff last year between the armies that was resolved after diplomatic intervention. They met earlier during Sitharaman's visit to Beijing in April to take part in the defence ministers' meeting of the Shanghai Cooperation Organisation (SCO).